Friendly Gold Fish layered on Ocean Blue. 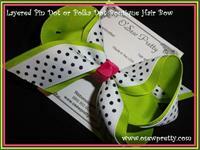 Place her hair up in our Flip Flop hair bow and join the summer fun! 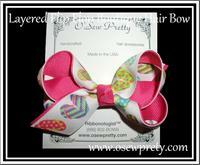 Hair bow shown on shocking pink ribbon, but available in your choice of bottom layer. 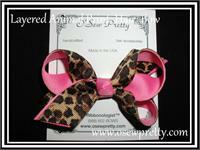 Available in 8 trendy animal prints and your choice of accent color. 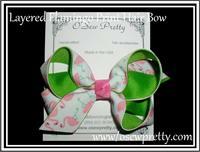 Place her hair up in our Flamingo hair bow and join the summer fun! 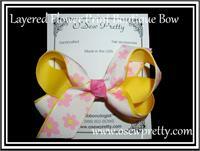 Four Brightly colored Flower prints to choose from, then layered on a coordinating color ribbon. 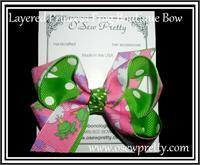 Friendly frogs and princess castles layered on green polka dot. 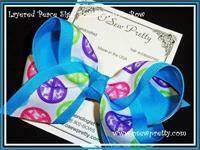 Boutique hair bow made from designer Peace Sign ribbon layered on your choice of accent ribbon colors. 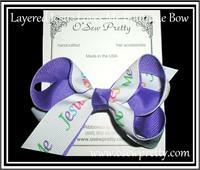 Place her hair up in our Jesus loves me hair bow and join the summer fun! 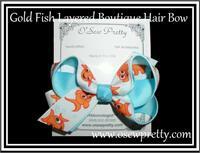 Hair bow shown on Delphinium ribbon, but available in your choice of bottom layer. 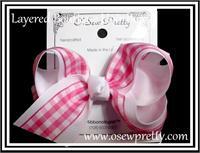 This is a great way to create just the right look for that new outfit or to just perk up an old one. 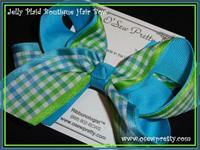 Your choice of jelly plaid layered on matching ribbon. Delicately Structured in exquisite Lace. 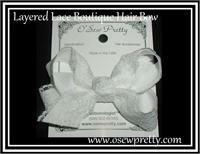 Shown layered white lace on white.